I haven’t been posting too much of my Tumblr archive lately and that’s my own fault. Here’s a look back at the first part of the Burial at Sea DLC for BioShock Infinite. I still look back at both of these with mixed emotions. It’s nostalgic, but ultimately kind of hollow. 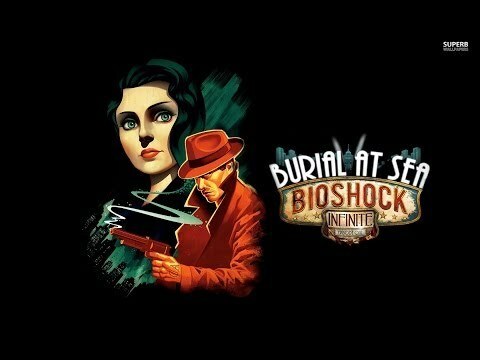 Today, we return to Rapture with the first half of the BioShock Infinite DLC, “Burial at Sea” The story revolves around Booker and Elizabeth mysteriously in an alternate Rapture prior to its collapse on New Years 1959. So, is this return to Wonderful, Wonderful utopia a worthy trip or should it remain in the briny depths below? Burial at Sea returns us to Andrew Ryan’s underwater utopia. Albeit, this Rapture is in an alternate universe influenced by tears from Columbia. Whether it’s from a man in a funny hat stealing from Suchong or the other way around, this DLC melds familiar elements from both worlds into a unique experience. The gameplay also mixes the experiences of both universes and it benefits quite well. The combat system in Infinite is much more of a pleasurable experience than in the original with more fluid combat layout for plasmids and guns that’s all around easier to adjust to. Now, this doesn’t quite make the combat overpowering. This coupled with limited ammunition/eve adds to an improved splicer-smashing experience. As such, Burial at Sea realizes that it’s more action-horror than survival horror, something the original BioShock tried its best to ignore. And while this expansion wasn’t scary per se, it’s wonderful to have the Big Daddies appear as a threat again. For a while, they felt like a marketing ploy due to their popularity! (I’m looking at you, BioShock 2!) But hey, they were used as shields between you and ADAM anyway. And so, the terror unleashed by your first couple brushes with them diminished quickly. Even though you could have predicted the final encounter, it doesn’t prevent the fight from being a very entertaining one. With the reveal of their new (retroactive?) power seen at the beginning of the game, escaping these metal titans becomes quite the challenge! The return of the weapons wheel was certainly a welcome addition. Albeit, you probably wouldn’t notice it for a while, since it’s not brought up and mechanically functions like Infinite’s weapon system (until you hold down the switch button or jump to inventory.) Considering BioShock has never been a realistic game, Infinite’s baffling weaponry inventory choice was a welcome departure. Despite the weapon wheel, I miss the split between dollars and ADAM. One of the few holdouts from System Shock II that I liked was splitting the “currencies” for both Upgrades/Health and Augmentations/Plasmids. It looks like money works for both circus of values and plasmid shops (minus the Gather’s Gardens?) But, this is no biggie. Other in-game items, like the “auto grabber” didn’t feel nearly as thematic in Rapture as it did in Columbia. At least the Plasmids in the Vigor perfume bottles kept in line with Rapture’s obsession with personal perfection and vanity. I know what they were trying to do, but it didn’t really work for me. The atmosphere in this game is conflicted as well. The introduction presents a thick, ambient film noir opening; complete with Elizabeth filling the role of Femme Fatale and Booker as the grizzled detective. Granted, this fades as we exit the office into the streets of Rapture. The atmosphere changes to David Lynch’s Blue Velvet. While some could argue that it fits, it still seems a tad jarring. At least the corroded environment of Fontaine’s department store fits the mood of the intro sequence. In juxtaposition to the previous segment, the department store is a bleak, dimly lit nightmare akin to the first couple games. Just like Civil War Rapture, damage is rampant and the locals contained within are completely insane. Combine this with the witty banter from Elizabeth and you have an enjoyable action and suspense packed romp through ol’ Franky’s ruins. Now, a final issue I had with this game was its tendency to compromise. It’s almost ironic when I felt the characters became aware of this! One of them even stated, “Compromise? Is that why we came to Rapture?” While I got over merging ADAM into Dollars, the way the game is divided up is certainly trying too hard to cover too many bases. The first part of the DLC is built upon sneaking around (with no direct consequence for action) and interaction based puzzles, while the second is a throwback shooter modeled off the first two Bioshock games. The attempt to mix the two is disappointing, as the game tries too hard to cram both aspects into the game. Both the first part and second part would have greatly benefited as independent, expanded episodes. In fact, ending episode 1 after “Cohen’s” would have been a perfect cliffhanger. As much as I enjoyed a return to a broken and sunken dystopia, I felt like I was ripped off in terms of exploring a functioning Rapture, with a living and breathing world. The beginning of BioShock Infinite arguably had a longer introduction without any combat. Market Street felt almost as confined as the Department Store, if for the wrong reasons. In terms of plot, it’s kind of a confused jumbled mess… similar to BioShock Infinite. While the plot of Ep. 1 slightly makes sense within the context of Infinite and its influence on Rapture, the ending comes across as jarring and cheap. Even with the hints dropped throughout the episode, it feels awkward to say the least. Without giving too much away, the ending of episode 1 pulls off a retcon only Steven Moffat can appreciate. Would I recommend this DLC? It all depends on whether or not episode 2 is a step up. Personally, I thought it was an enjoyable (yet underwhelming) return to Rapture. The power of nostalgia and the familiarity of both control scheme and setting pushed me from beginning to end. Not to mention the various sights to behold in both stages were very a blast to comb through. So, if you’re willing to overlook these issues, give this DLC a try! That or wait for the second episode and play them back to back. Time will tell on how well Ep. 2 does. With that, BioShock infinite: Burial at Sea Episode One gets 6 doses of ADAM out of 10.